Hardwood floors are unique. Whether you’re remodeling, building or just refreshing your home, there are tons of hardwood flooring types to choose from. And since no two woods have exactly the same grain or color, your floor will be 100% unique and reflect your style. Hardwood floors are a great investment. Solid hardwood floors will last for generations to come and can be sanded, stained and refinished numerous times to maintain their beauty or change their color. 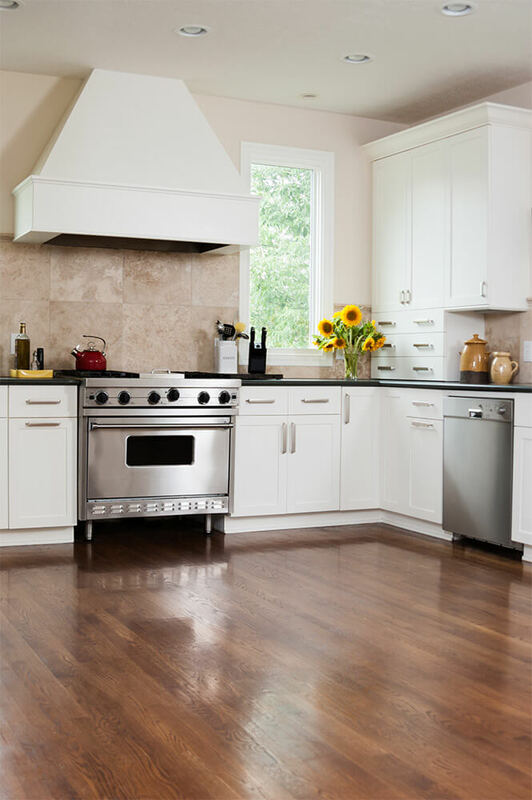 Plus, hardwood floors are widely acknowledged to add value to a home. Plus, the variety of available options lets you meet your taste AND budget. Hardwood floors are easy to maintain. Hardwood floors are much more resistant to staining than carpet or tile and cost much less to maintain. If damage occurs, it’s relatively easy to repair a hardwood floor by sanding and refinishing it rather than replacing it. Hardwood floors don’t harbor allergens. Unlike carpet, hardwood floors don’t trap dust, dander, pollen, mildew and other nasty substances that make life miserable for allergy sufferers. There are also a wide variety of low-odor non-toxic stains and finishes to further reduce indoor air pollution. Hardwood floors are sustainable. Not only will hardwood floors help keep your environment safe and clean, they are also a healthy choice for our global environment. Since wood can be recycled and renewed, it is a much more eco-friendly choice than other types of flooring. From a comfy traditional Southern look to a sleek and stylish contemporary motif, Peach Design is committed to quality and artistry. Whether you need cleaning, refurbishing or completely new flooring, we’re the professional experts at crafting your dream hardwood floors. My wife and I are thinking about renovating our living room and adding hardwood floors, but we still aren’t sure. I do like that you mention the fact that allergens don’t get caught in hardwood floors like they do carpet. This would definitely make the Summer more bearable with fewer allergies. Thanks for sharing! I do like that the article brings up the fact that hardwood floors are easy to maintain. After all, that is one of the big reasons that many people choose to use them for flooring. For example, a hardwood floor only require sweeping and some mopping, no vacuuming is needed.